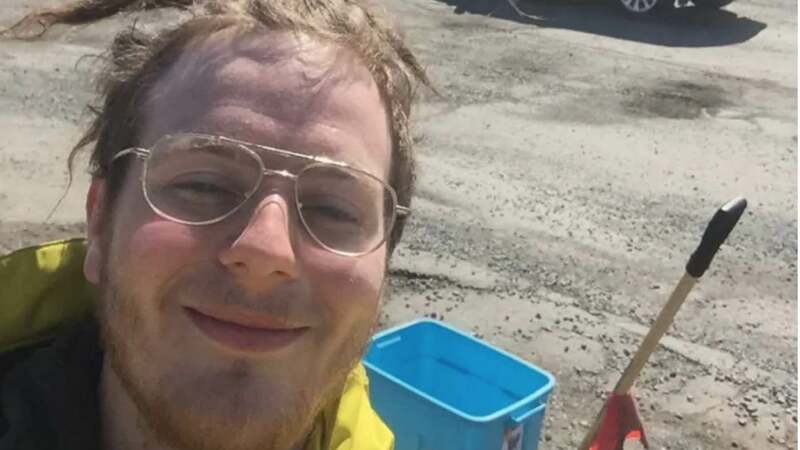 This 22-year-old man has become something of a folk hero to the people of Canada after he spent several days temporarily filling in some treacherous potholes. John McCue first became inspired to patch up some of the road hazards in Stellarton, Nova Scotia after he and his mother drove over a particularly nasty pothole. “There was one story a couple of weeks ago where a car was driving through and it nailed one of the biggest potholes here and it ripped the axle right off the car,” McCue told CBC. Rather than waiting for the city government to fix the pavement, McCue grabbed a snow shovel and started shifting gravel and road fill from the roadside ditches and moving it into the potholes. Now that passing traffic has packed the filling into the holes, McCue said that the road is significantly better than when he started. That being said, local police officers had warned McCue that if he did not stop his mission, then he would be charged. Even though the penalties may vary, DIY road repair is strongly discouraged across various state and regional governments because it can compromise the safety of the road and the civilian. Additionally, drivers or civilians can take legal action in the case of an accident involving an unlicensed road repair. Additionally, passing motorists have expressed their gratitude towards the roadside vigilante by tipping him in cash, cannabis, and warm cups of coffee. “Yep, I’m definitely getting a lot of tips — I had a couple of people give me some joints, too, which is pretty nice,” he mused. McCue told CBC that he hopes to use the money to pay for his upcoming move to Alberta in May.